30210 AkroBins optimize your storage space. Control inventories, shorten assembly times and minimize parts handling. Heavy-duty polypropylene bins hang from Akro-Mils racks, panels, rails, and carts; securely stack atop each other and sit on shelving. AkroBins are unaffected by weak acids and alkalis. Sturdy, one-piece construction is water, rust and corrosion proof and guaranteed not to break. Autoclavable up to 250F. Full width hanger lip supports heavy loads when suspended from hanging rails or louvered panels. Reinforced side-rib design adds strength and prevents spreading when stacked. Akro-Mils products save time and money by helping to increase material handling efficiency in virtually any industry. Our broad range of storage, organization and transport products are used to shorten assembly times, maintain accurate inventories, optimize storage space and improve parts protection. Our mission at Akro-Mils is a commitment to manufacturing innovative storage and material handling products of uncompromising quality at a fair price. We support this commitment with professional representation and consistent, superior service to meet the needs of our customers. For quality products backed by more than 60 years of reliable delivery and responsive customer service, we invite you to turn to the Akro-Mils advantage. 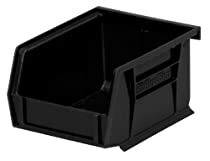 I bought these (Akro-Mils 30210 Plastic Storage Stacking Hanging Akro Bin, 5-Inch by 4-Inch by 3-Inch, Black, Case of 24) to organize my Tool chest misc drawer. I could not find something that was deep enough yet not too big. In my bottom drawer (insde 22.5" w x 15.5 d) of my craftsman tool chest base, I put 3 rows of 5 (15 bins) on top of a rubber mat so they do not slide around. This drawer was 5.5" deep. I then put two of the (Akro-Mils 5905 Plastic Parts Storage Case for Hardware and Craft, Large, Clear) cases side by side on top of the 15 bins. It fits the drawer very well without being cramped and I can easily take one case out and slide the other left/right to get to the bins. this really cleaned up and organized all my screws, nuts, hangers, electrical connectors, et. al. I then used the other 9 bins in shorter drawer. The height of these bins are just right for these type of rolling tool chests, and you can pull out what you need and stack them on the workbench or whatever. These storage bins are very versatile and do exactly what they are designed to do. I highly recommend them to anyone looking for small part storage.